I’ve always loved meat loafs, so I decided to make a vegan version that uses cooked lentils instead of ground meat. It’s really easy to make, it’s high in fiber and protein and most of all it’s incredibly DELICIOUS!! 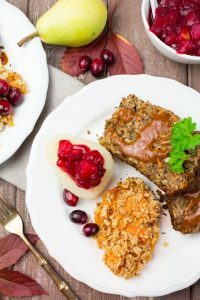 vegan Thanksgiving lentil loaf with a mashed pumpkin and sweet potato casserole with a nut-oat topping, vegan gravy, and cranberry pear sauce. First, cook the lentils according to the instructions on the package. Then put about 6 tablespoons of the cooked lentils aside. You’ll need them later on to give the lentil loaf a bit more texture. Sauté the onion and garlic for about 2 minutes. Then add the chopped carrots and cook them for another 3 minutes. Put all ingredients except the spices into a blender or food processor and blend until you have a sticky but chunky mixture. It’s very important that you make sure to not overdo it, so you still got some texture. Add the remaining lentils and season with thyme, oregano, salt, pepper, and fresh parsley. Place the mixture into a loaf pan lined with parchment paper. Make sure to let the parchment paper overlap the loaf pan, so it’s easier to remove the lentil loaf once it’s done. Bake the vegan meat loaf for 60 minutes at 350°F. In the meantime, make the pumpkin and sweet potato mash. Cut both into small cubes and cook for about 10-15 minutes or until soft. Mash with a potato masher and add the vegan margarine, salt, pepper, and a pinch of nutmeg. For the nut-oat topping, chop the walnuts or Brazil nuts into small chunks and roast them in a small pan for about 2 minutes. Then add the oats and some more vegan margarine. Season with salt, pepper, and red pepper flakes. 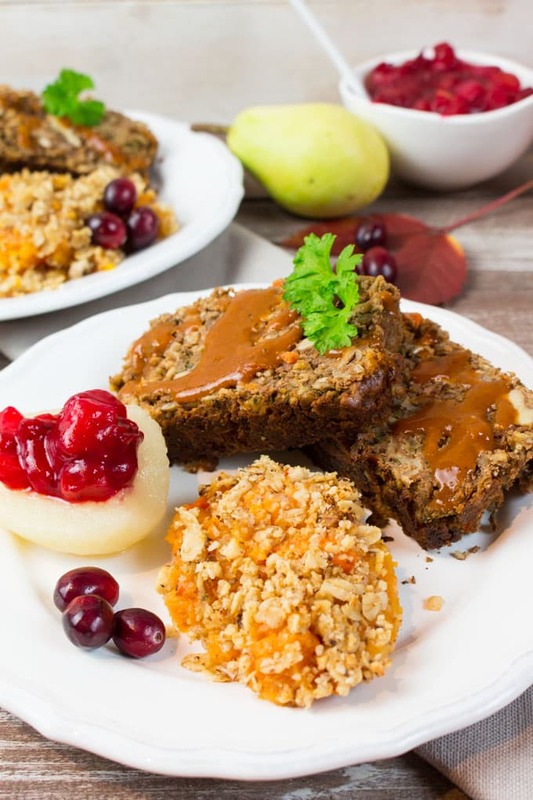 Pour the mashed sweet potato and pumpkin into a baking dish and sprinkle with the nut-oat topping. Bake for 15 minutes at 350 °F. Sauté the onion and the garlic for about 2-3 minutes. Then add the carrots and the celery and cook for another 3 minutes. Stir in the tomato paste and cook until it becomes slightly brown. Then stir in the flour and deglaze with red wine. Allow to evaporate. Then add the vegetable broth. Season with oregano, paprika powder, rosemary, salt, and pepper. Reduce the heat and simmer for 25 minutes. Pour the gravy through a sieve using a ladle. Put it back into the pot, so you can heat it up once the rest is ready to eat. For the cranberry pear sauce, cut the pears into medium-sized cubes. Put them into a small sauce pan together with the cranberries. Add the water and coconut or brown sugar and cook for about 15 minutes until the cranberries are popped and the pears are soft. To give it some more flavor, add some ground ginger. The sauce is supposed to thicken to a jam-like consistency. Serve the cranberry pear sauce in canned pear halves. This entry was posted in BLOG and tagged health, nutrition, recipe, vegan. Bookmark the permalink.